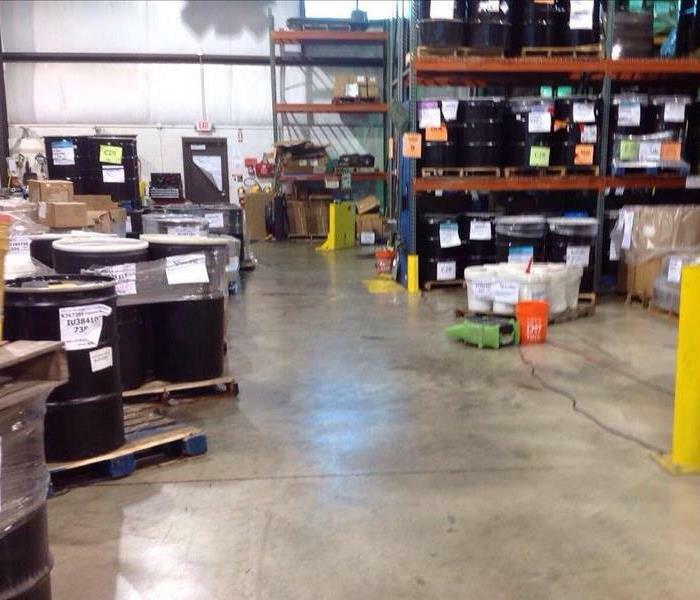 This local business unfortunately had flooding in their warehouse. SERVPRO of Greater Highland/White Lake was able to come into the water loss, remove the sitting water and take care of the drying process. 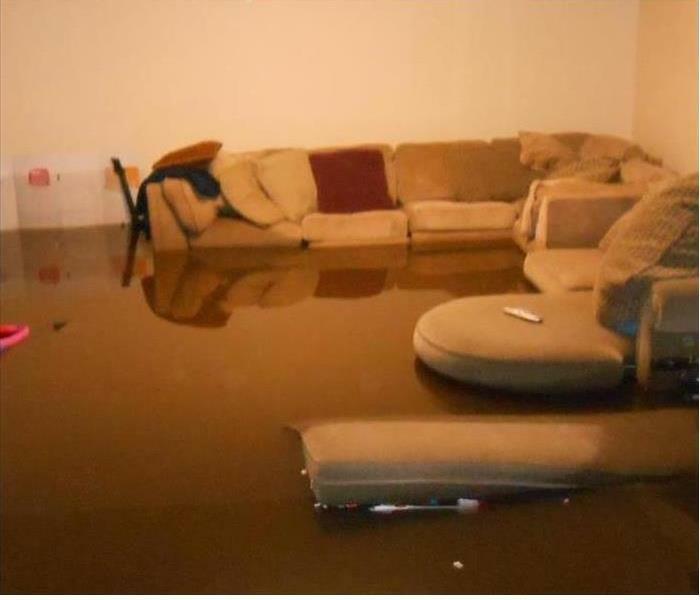 Here is a picture of a home that had a water loss. The water covered their carpeting, which meant we need to dry the carpet out. In this case we used a technique called floating the carpet. 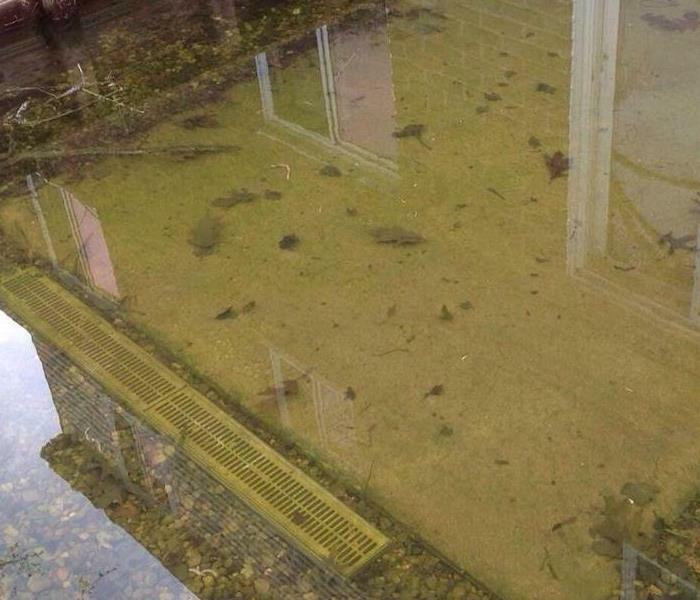 A local assisted living facility had a water loss, unfortunately causing a few residents to move out of their homes. In this situation, its extremely important for our crews to work efficiently to keep costs lost, and to get the residents back into their homes as soon as possible. Our crews worked day and night to get the facility back to normal. Water losses happen all the time. There can be many different causes, such as a broken pipe, sump pump failure, or flooding. Whatever the circumstance, let SERVPRO help you! Our crews have the IICRC knowledge and the best equipment in the industry to take care of our customers! Mold found in the home is not uncommon. Many of us are currently living in a home with mold, but we might never know. Its important to call your local SERVPRO if you start to smell a musty odor, or find a leaking pipe with signs of mold. Let us help you with the remediation process. If you find mold in the home its important to properly handle the remediation process. Bleach alone cannot take care of mold. Its important to use the correct products, to kill and stop the growth of future mold. Let the trained and certified technicians of SERVPRO help you! To prepare for Michigan storms it's important to make sure all dead limbs are cut down, especially those surrounding the home, and vehicles. 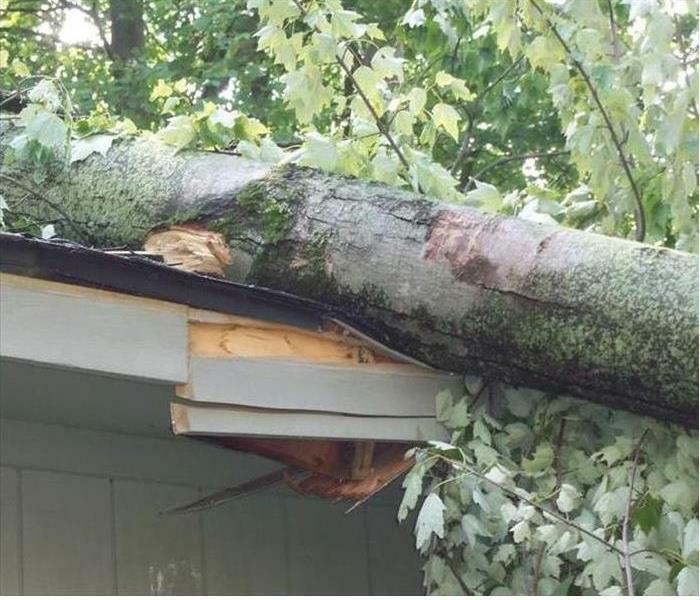 This photo shows a tree fallen on a customer's home. We all love to burn candles in the home, especially around the holiday seasons. Unfortunately, it can be very dangerous if you forget to blow the candle out or if it falls. 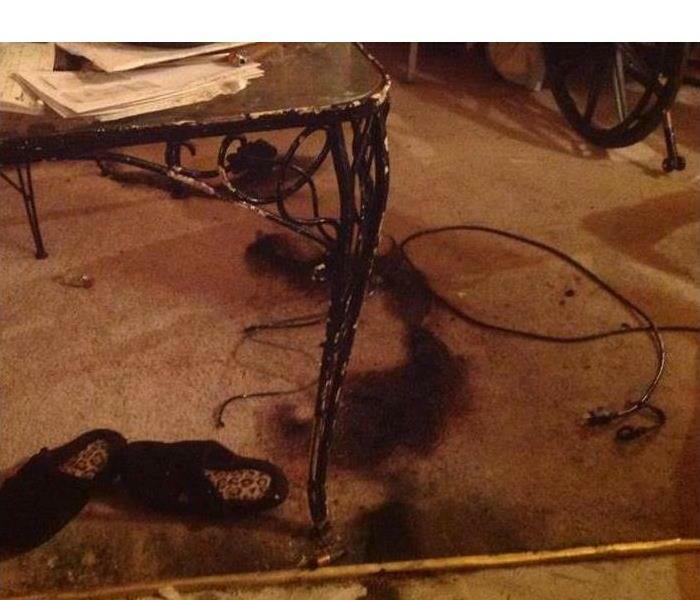 This photo shows a carpet damaged by a candle. 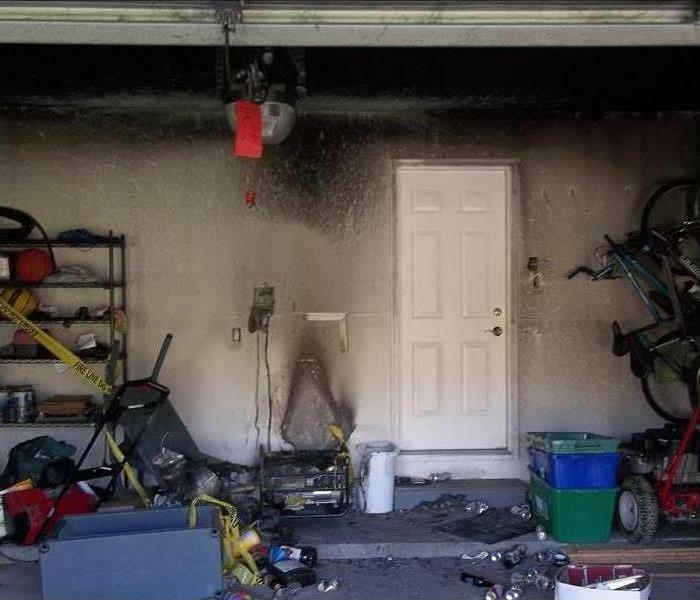 Garage fires are very common, one of the most common calls we receive. This is because there are so many flammable items in the garage. There are also many appliances charged into the walls. 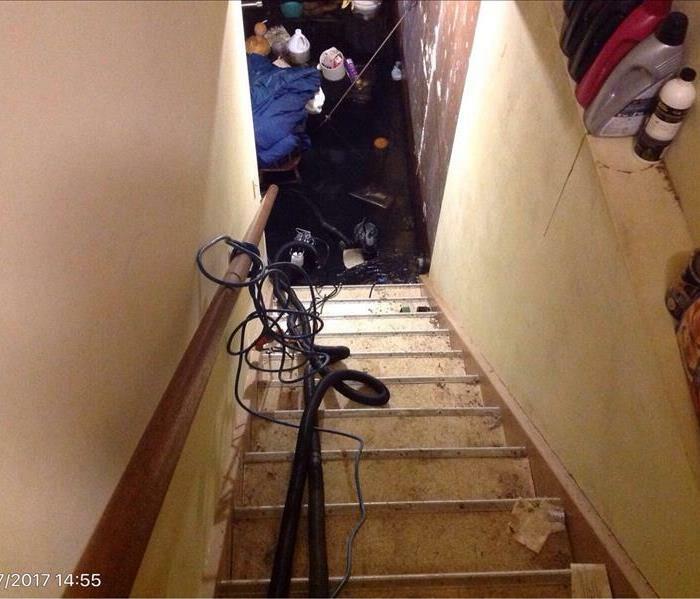 These homeowners had the horrible experience of walking into their home after a long day of work to find water creeping up their staircase. 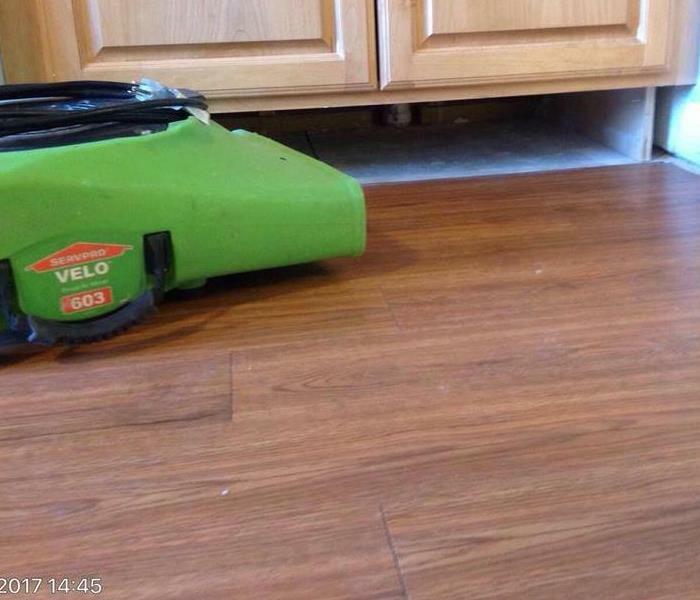 SERVPRO of Greater Highland/White Lake was there in no time to start the drying process! 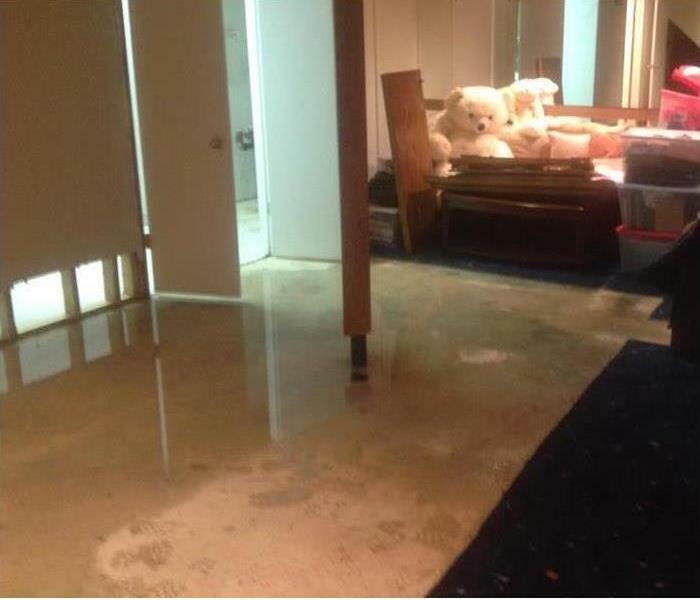 Unfortunately, this customer came home to find water all throughout their finished basement. SERVPRO of Greater Highland/White Lake was able to get to the scene to start the water removal process immediately. Water loss can happen to anyone, at any time. 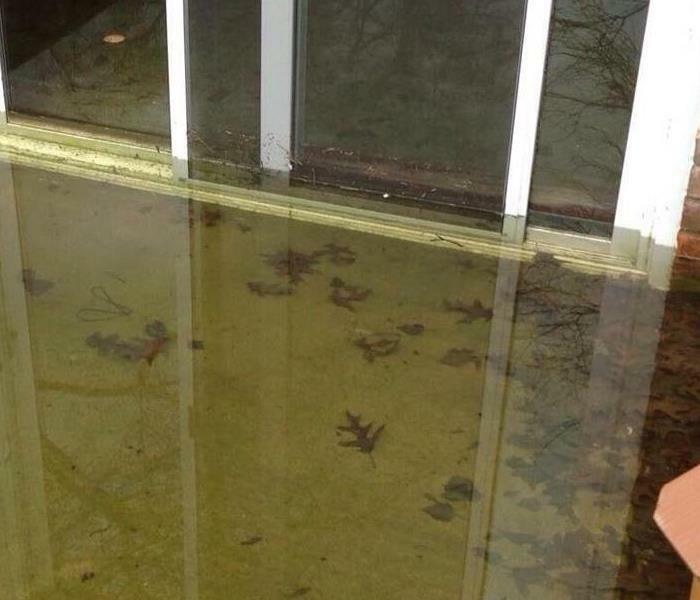 This local homeowner came home to a basement filled with water after a sump pump failure. 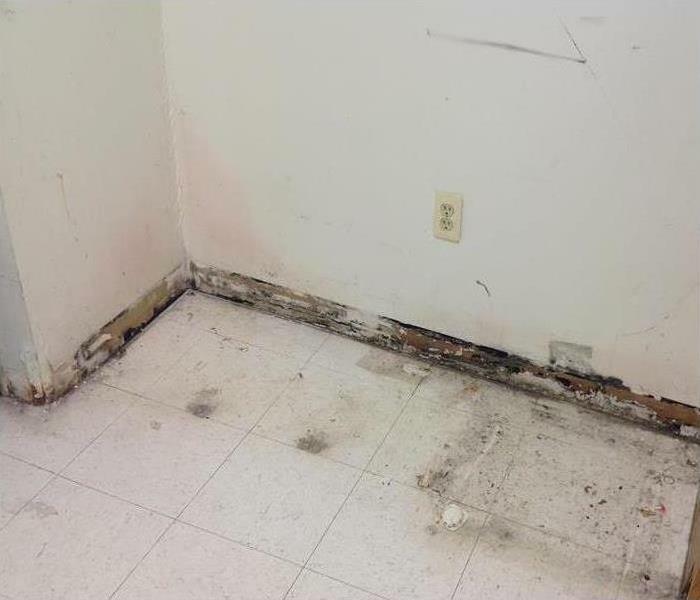 The homeowner couldn't believe how quickly SERVPRO was there to remove all water, and to start the remediation process. 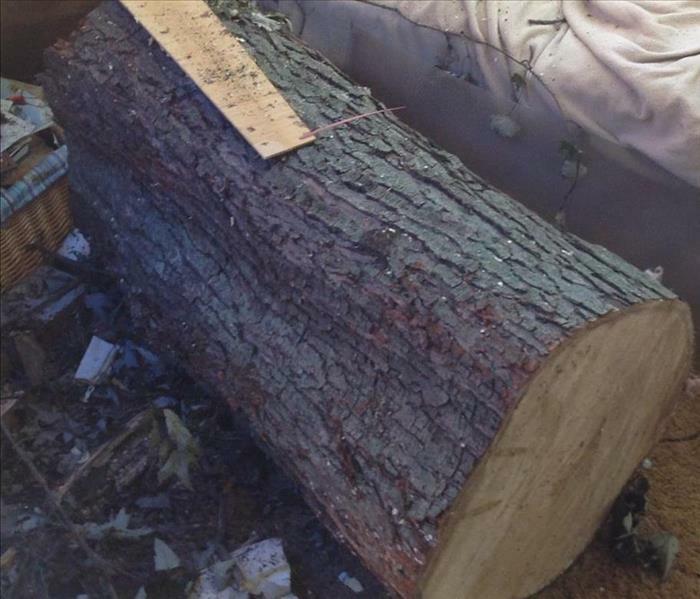 This homeowner came home after a strong storm to find that a tree fell on their home. Everyone was safe, but the home required heavy clean up after the storm, including the chopping and removal of this tree. Strong winds can do a lot of damage to a home. Its important to have the right team take care of the clean up process. SERVPRO of Greater Highland/White Lake is always available to help the community after any storm! 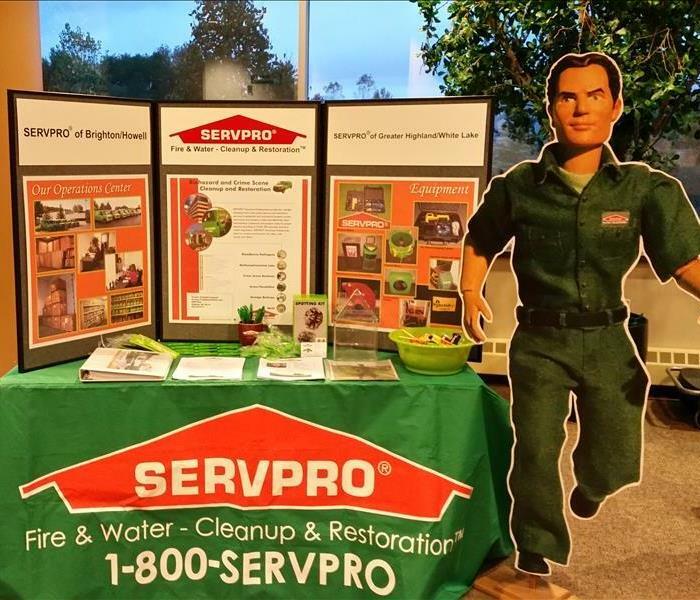 SERVPRO of Greater Highland/ White Lake has the top equipment and trained crews for mold remediation. Let us help you restore your home, "Like it never even happened." Call us today! This photo depicts mold damage. Mold can be very dangerous to homeowners, causing many health concerns. It is important to have the SERVPRO IICRC certified crews come in for proper removal, and cleaning. 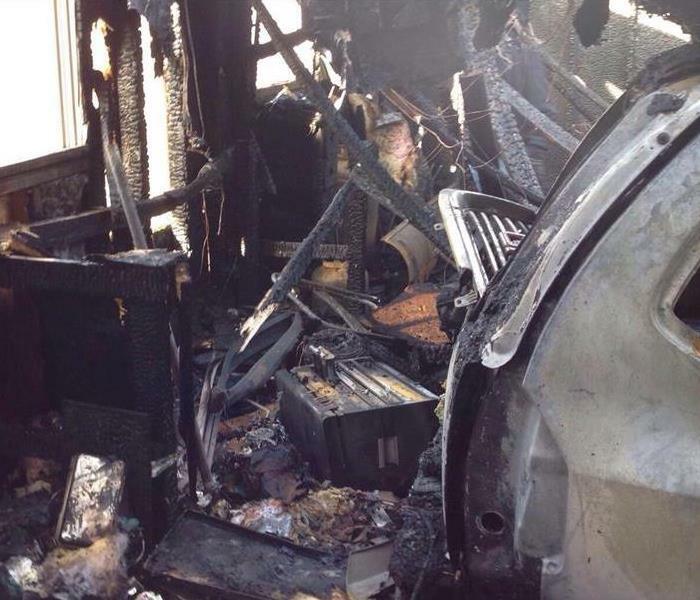 Fire damage can affect every aspect of a home. Let SERVPRO of Greater Highland/White Lake help restore your home from the inside and out. Our team is IICRC certified and prepared to help you! 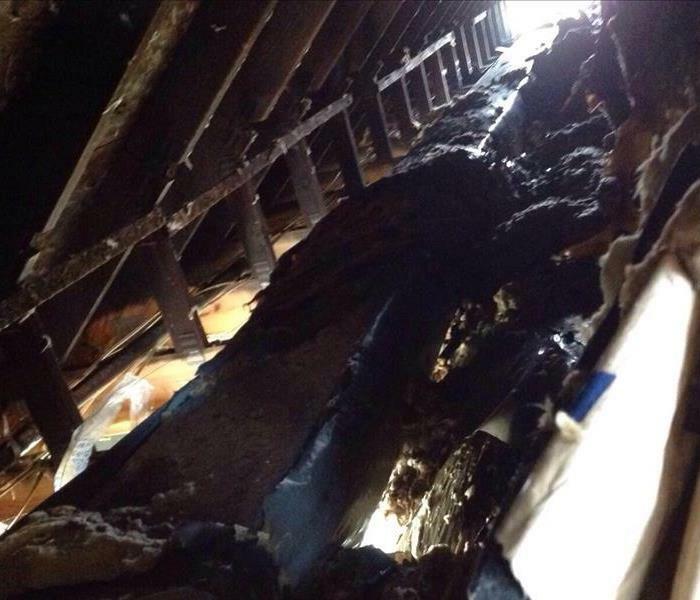 Smoke and soot can become trapped in the attics of homes, leaving the smell of fire behind. Let SERVPRO of Greater Highland/White Lake safely inspect your home, to find all areas affected by the smoke. When a fire occurs, safety is at the up most importance for everyone. When our crews arrive on the scene they will invested the structure prior to entering the home. Many past customers have been shocked with the ability that our SERVPRO crews have when it comes to restoration. Let our team help evaluate, and work to bring your home back, "Let it never even happened!" 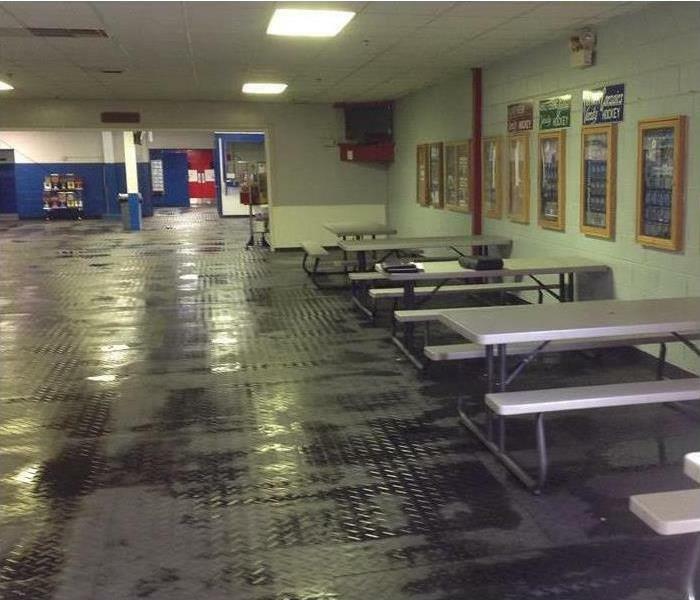 This photo is from a local ice rink, which called SERVPRO for assistance for this water loss. SERVPRO of Greater Highland/White Lake was able to come in and help remove water and take care of the proper drying process! Every business need a space to store their items. Unfortunately this owner had a water loss in this space. 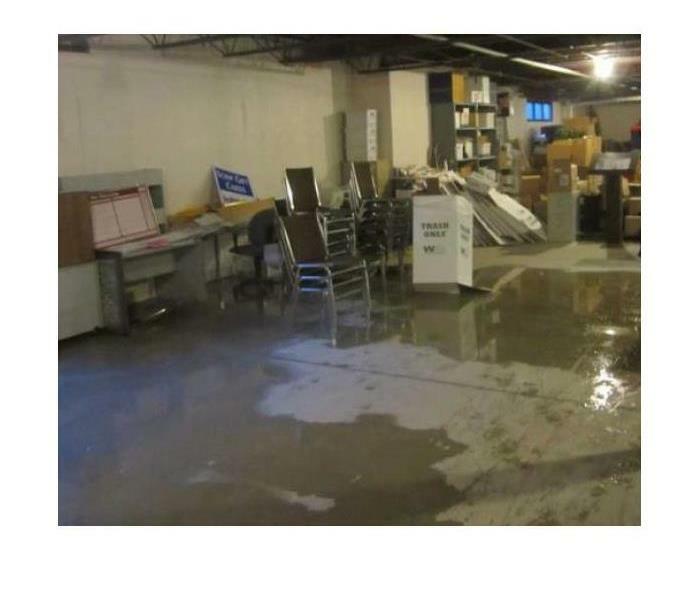 Luckily SERVPRO of Greater Highland/White Lake was able to save everything in the storage space! 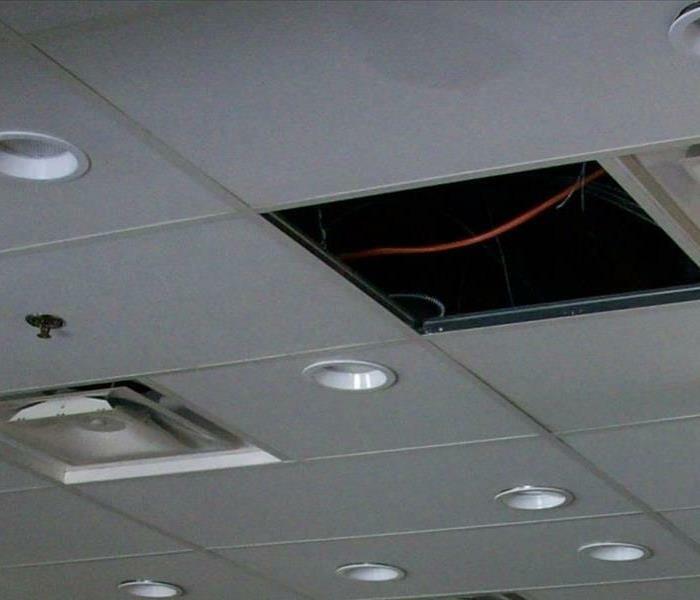 This business had a leak in their ceiling causing major damage through the property. 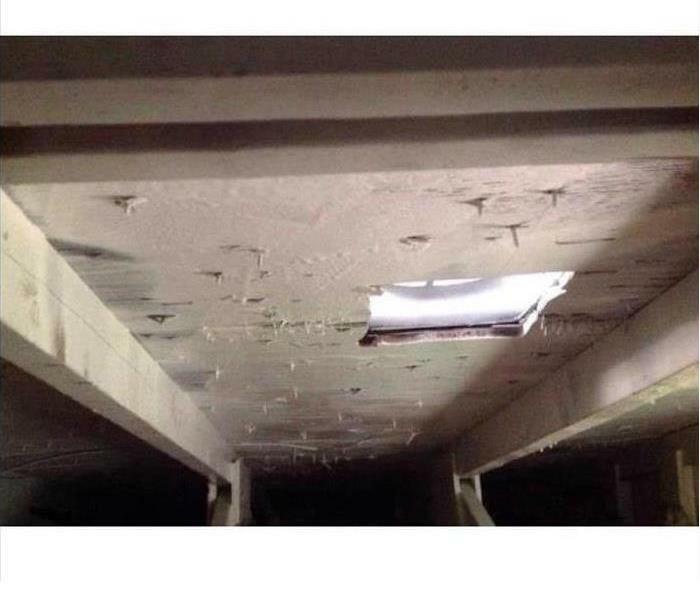 SERVPRO of Greater Highland/White Lake was there to clean the mess, and repair the damaged ceiling. 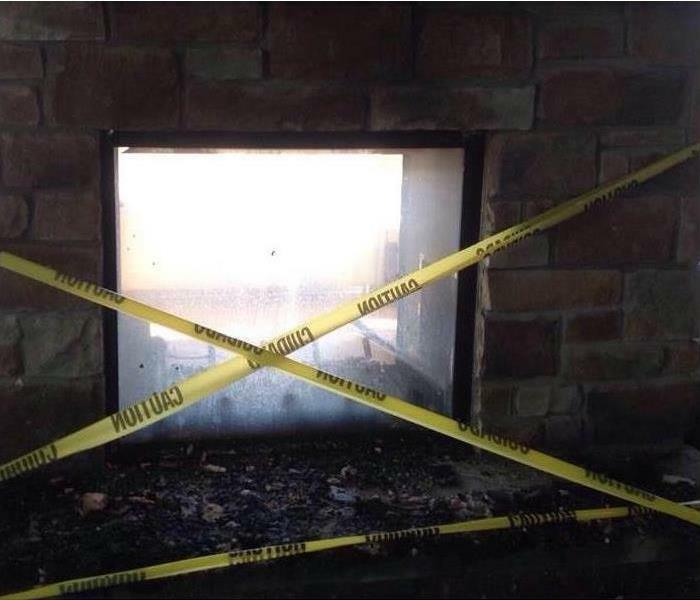 They were able to re-open just a few days later. Here at SERVPRO of Brighton/ Howell and Greater Highland/ White Lake, we get called out to do several bat guano cleans each year. Bat guano is very toxic to humans and once the bats have been removed from the home, we come in and remove the affected insulation, fully hepa vac the area and disinfect and deodorize before new insulation is installed. 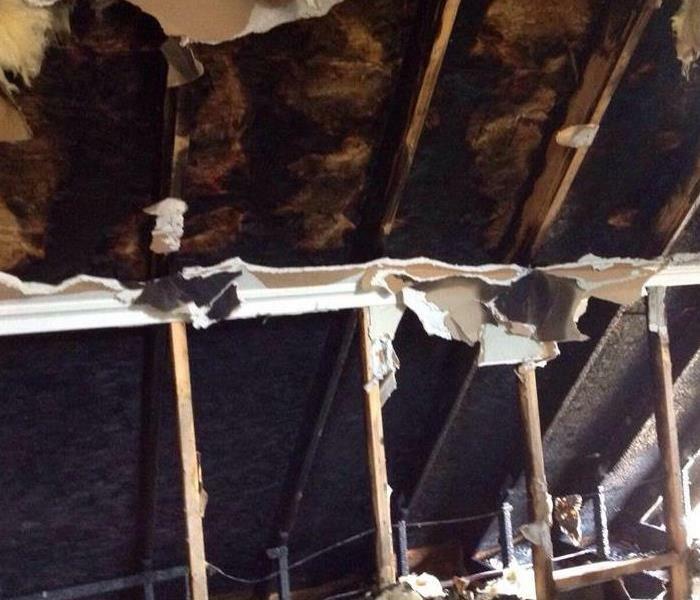 This is the result of a pipe break in a summer home that went unnoticed for several weeks. 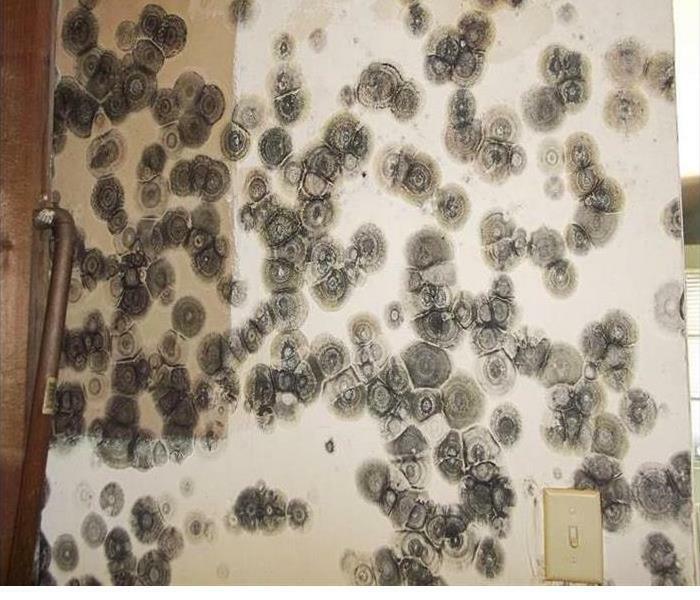 Due to the increased humidity in the home, the entire home was affected with heavy mold. The homeowner was in disbelief at the amount of the damage, but were pleased that we were there to help them through this catastrophe. This is what our technicians saw when they first arrived at a pipe break at a very prominent local business. We were able to get the damage cleaned up and drying equipment in place that day. The business was very pleased that we were able to respond so fast and that they were able to continue operations. 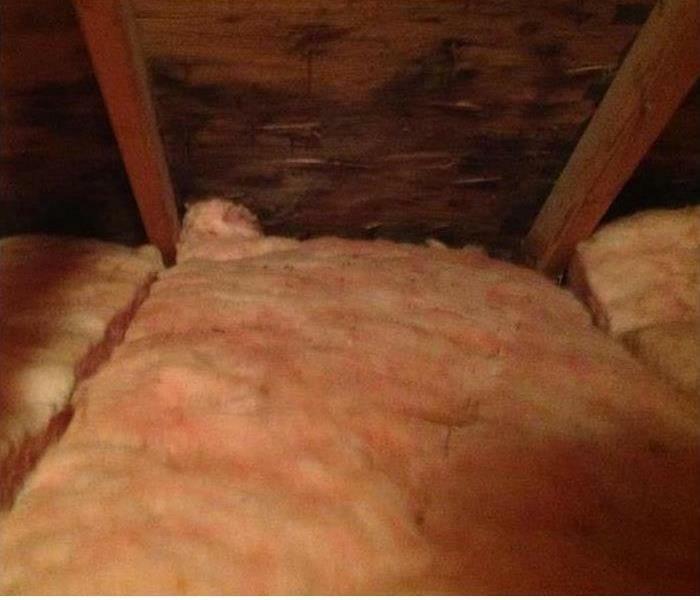 Attic mold is very common but we were very surprised by the mushrooms we found growing on the roof sheeting in an attic. Due to improper ventilation there was an increase in humidity, creating the perfect environment for mold to grow. This damage was caused by a power outage. When the power went out, so did the furnace and pipes froze and broke and without power the sump pump did not work causing the basement to flood. We were able to set up generators for temporary power and were able to pump the water out and dry the structure, making the owners family very happy. This is one of the many community events that SERVPRO of Brighton/ Howell and Greater Highland/ White Lake participate in. Area realtors are very interested in finding our about the services we provide and how we can help them sell a home. SERVPRO® does everything possible to prevent the homeowner's property and contents from becoming dirty, dusty or damaged during the demolition/mitigation process. Covering furniture and contents completely with plastic, and isolating the area with a containment barrier before the demolition begins, helps to prevent dust and debris from getting into the cracks and the crevices. To protect flooring a path of cardboard, plastic or cloth is placed over the unaffected areas that lead from the work area to the exit door. This keeps other areas of your home cleaner and prevents the tracking of dust and debris throughout the home. When carpets are cleaned, corner guards are used to protect the walls and block/pads are placed under the furniture to ensure there is no damage to the furniture from the moisture of the freshly cleaned carpet.